Mayor Hickenlooper and Governor Ritter Inhaled! Putting the high back into the Mile High City. Governor Bill Ritter and Mayor John Hickenlooper were feeling no pain the day they filmed a promotional ad for the 9HealthFair, an annual community project that KUSA Channel 9 has been running for close to thirty years. To hype this year's incarnation, which runs April 12-20, Ritter and Hickenlooper filmed a commercial in which the pair, looking dignified (or close enough) in business suits, chatted as they filled balloons with helium — the fair had a lot of locations, they noted — and then, after a cutaway showing how to find those locations at http://www.9news.com, the camera returned to the politicians, now giggling and speaking in squeaky voices. Clearly, they'd inhaled. 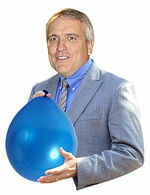 It was fun while it lasted, but the contact high quickly wore off — particularly after viewers called the station, and City Hall and the Capitol, to suggest that it was inappropriate for two elected officials to be huffing...even huffing helium. "They were having some fun," news director Patti Dennis says of good sports Ritter and Hickenlooper. But after about a week, the complaints outweighed the fun factor —particularly since the 9HealthFair is supposed to promote clean living — and the station decided to simply snip the offending footage from the commercial. "We upset them enough," Dennis says of the station's regular newscasts. The site is updated regularly so bookmark it and check back!